"I was so shocked when I heard I had won," said Mr Van Heerden. "It's surreal. I had a coffee and a sit down to take it all in." Father-of-two Mr Morris set up Bookends in 2014 after decades working in the publishing industry. "I'd always thought Cardigan needed a book store and one night I was on eBay when I saw 18,000 books for sale - and it went from there. "Two lorry trips later - and six days of shelf stacking - the shop was up and running and has hosted in-store appearances by poets and authors. However, with Mr Morris' osteoarthritis worsening over the years he reluctantly decided to call it a day - but wanted to sell it with a difference.For three months, people who spent more than ?20 were entered into a raffle. "I didn't want to sell the shop and then see a chain take it over - I wanted it to stay a bookshop but give someone different a go," he said. "I figured a raffle would be good, because no-one loses. Even if they did not get the shop, they still have some great books to read." 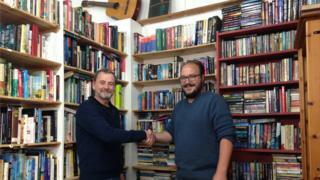 On 1 September, number 33 was picked out of the hat to the tune of The Winner Takes It All by Abba in a packed bookshop.Its new owner Mr Van Heerden, known to friends as CJ, learned of his good fortune through a text message.He said he plans to run the shop with his friend Svaen Bjorn, from Iceland. The pair have been friends for the past nine years after meeting on the internet - but have never actually met face-to-face. "It might sound strange, but we can make it work and it is just an amazing opportunity," said Mr Van Heerden, ahead of the formal hand-over on 5 November. » Up in smoke: Is the vape shop boom about to end?